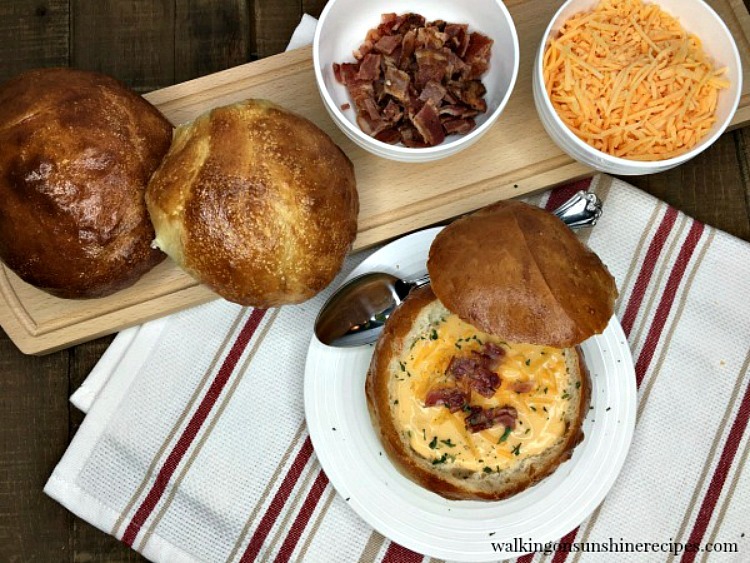 How fun to serve soup in bread bowls! 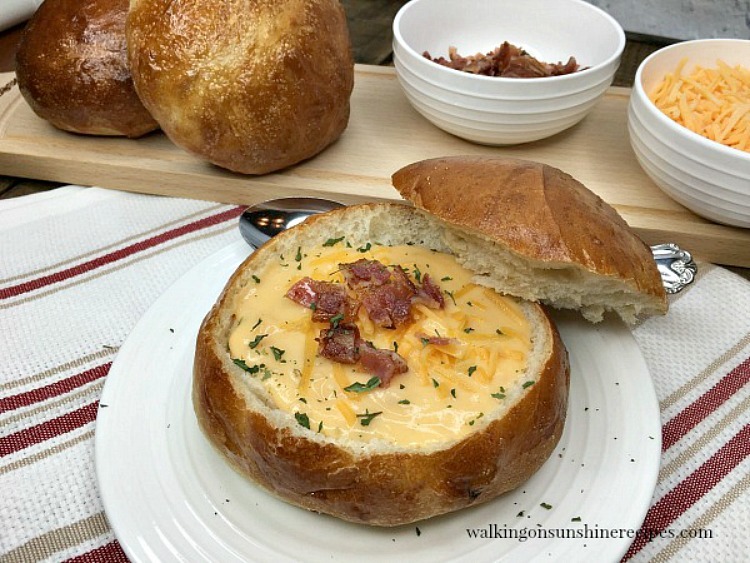 My husband loves getting soup in a bread bowl when we’re eating out so I thought it would be fun to make my own bread bowls to serve with our soup last week. They were incredibly easy to make too! My family loves having soup for dinner…especially during the cold winter months. There’s nothing quite like a bowl of soup to warm you up at the end of a long day. Whether you’re coming home from work or from running the kids to their after school activities, soup can be an easy choice for dinner. Serving the soup in homemade bread bowls makes the soup even more delicious and fun to enjoy at the end of a long day. I recently discovered Idahoan® Steakhouse® Soups. They are so easy to make and perfect for dinner on cold wintry nights. They give you the flavorful, slow-cooked taste of restaurant-quality soup at home and in just five minutes. That’s right five minutes. 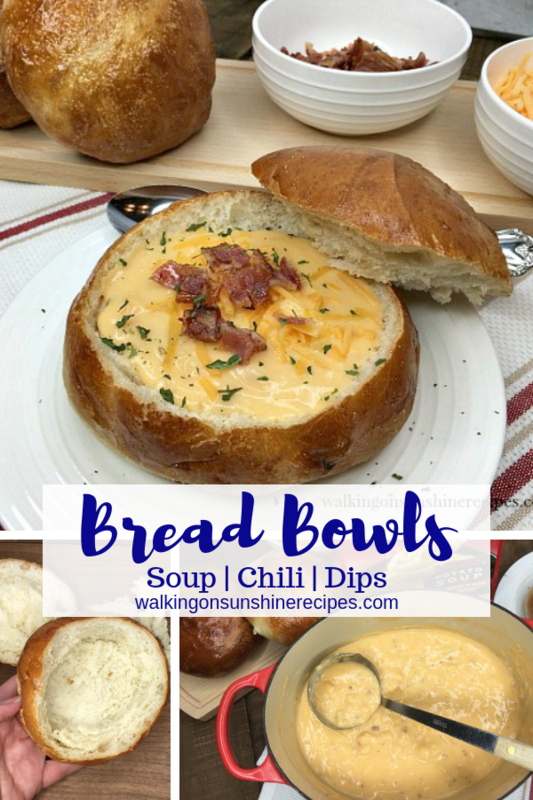 I used a packaged soup mix for these bread bowls, but in case you wanted a homemade soup recipe, please check out these other family favorite recipes. Homemade French Onion Soup – video included! Allow one loaf of frozen bread dough to come to room temperature. 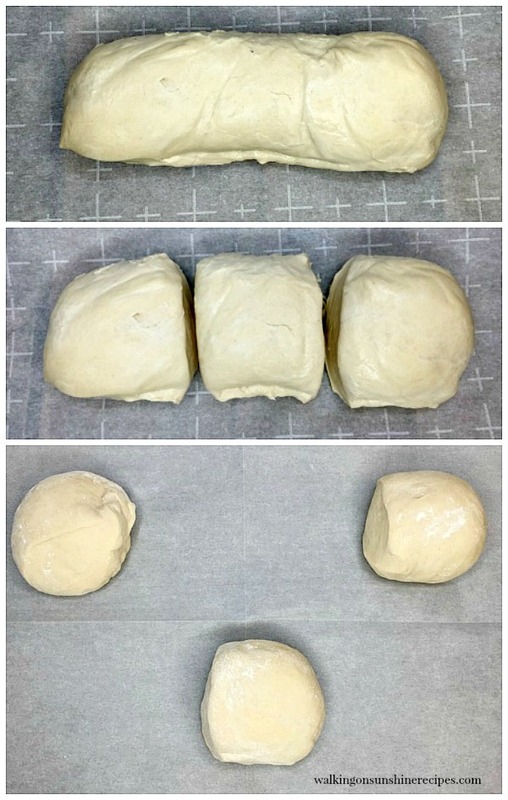 Cut the bread dough into 3 even pieces and roll each piece into a ball. Cover with plastic wrap and set aside for them to double in size…about 1 to 2 hours. The easiest way to thaw your frozen dough is to refrigerate it 6-8 hours before you need it. I like to take the dough out of the freezer the night before I plan on making bread bowls and let it defrost in the refrigerator overnight. You can use the microwave to help defrost the frozen bread dough, but be careful and watch closely so you don’t overheat the yeast. Microwave for 5 minutes on the defrost setting for one loaf of frozen bread dough. Make sure your kitchen is warm when you’re working with bread dough to help aid in the rising of the bread bowls after they’ve been formed. After the balls of dough have doubled in size, brush with the beaten egg. Bake in a preheated 350 degree oven for 25 minutes or until the bread dough balls are golden brown. Allow the bread bowls to cool to room temperature before cutting. With a knife at a angle, slice the top off the bread bowl. Gently remove a good portion of the bread to make room for the soup. 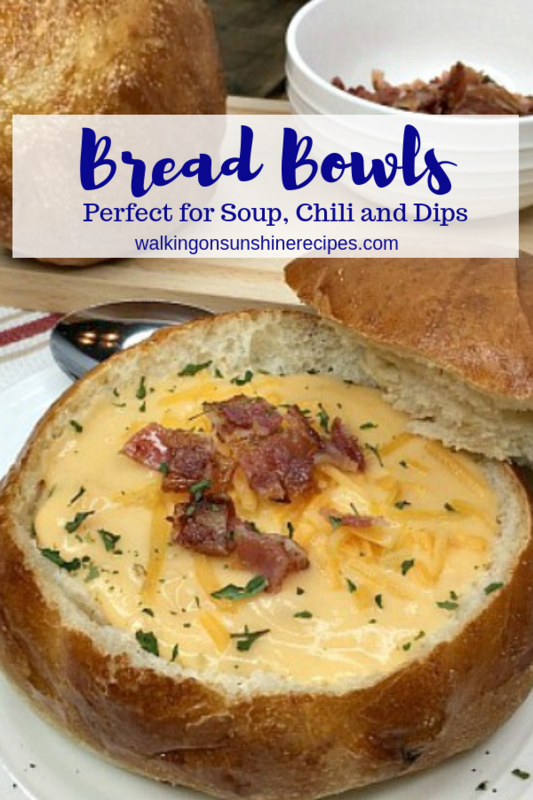 Add the prepared soup to the bread bowl and top with your favorite toppings. Serve with the top of the bread bowl on the side to enjoy as well. 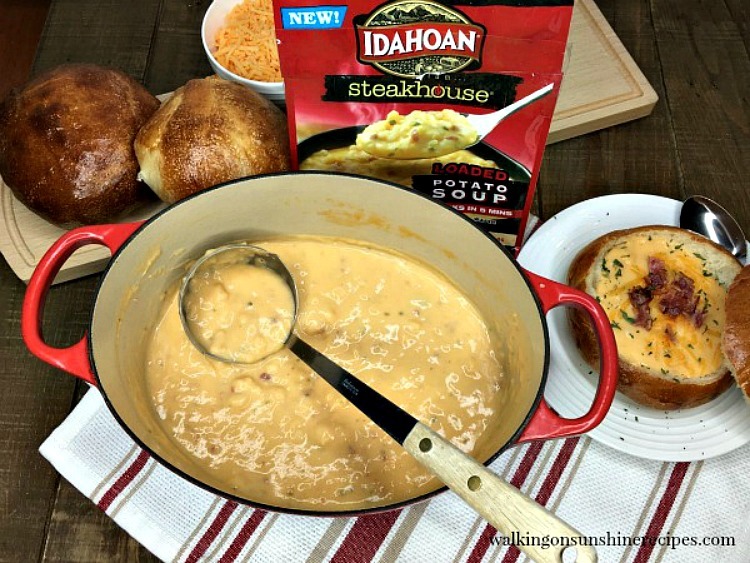 The Idahoan® Steakhouse® Loaded Potato Soup came together FAST! 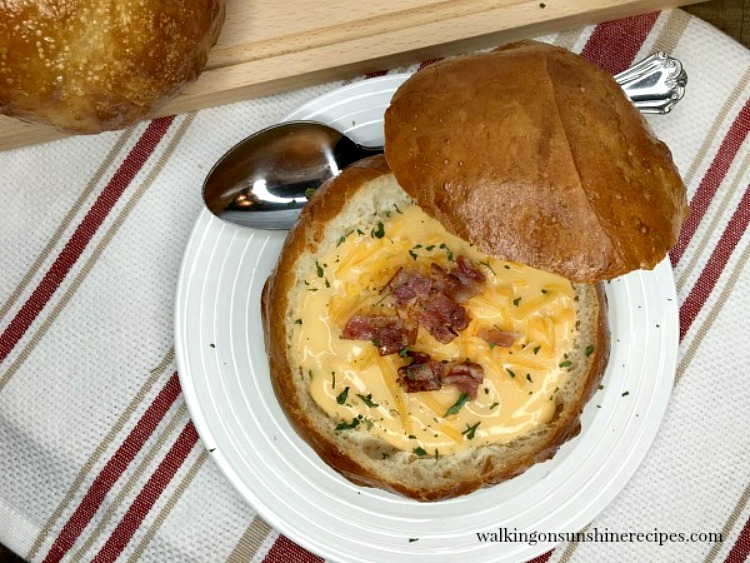 My family loved the potato soup served in an individual bread bowl and I know your family will love making these easy bread bowls too. 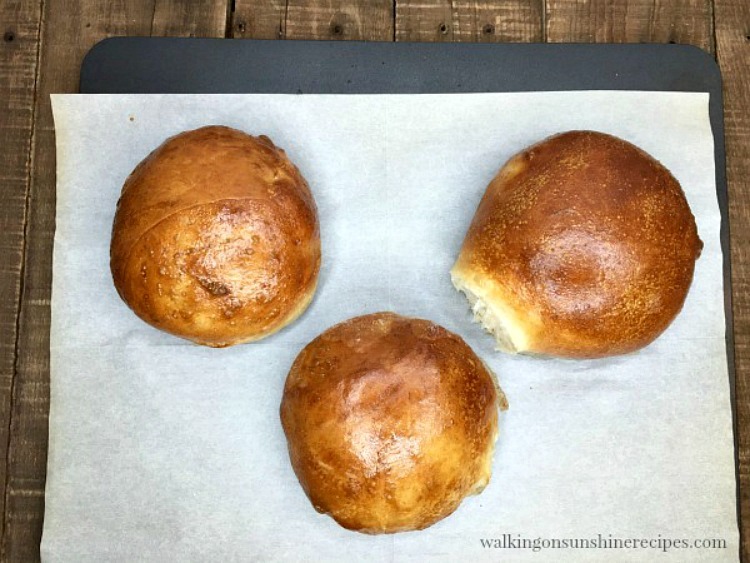 You are going to love how easy these bread bowls are to make when you start with a loaf of frozen bread dough. You can use these for soup, chili, stew or even dip. Slice the loaf of thawed bread dough into three even pieces. Place each ball of bread dough on the baking sheet with enough space between each ball so there is room for the bread to rise and expand. Cover with plastic wrap and set aside for the bread dough balls to double in size; about 1 to 2 hours. Once the bread dough balls have doubled in size, carefully remove the plastic wrap. 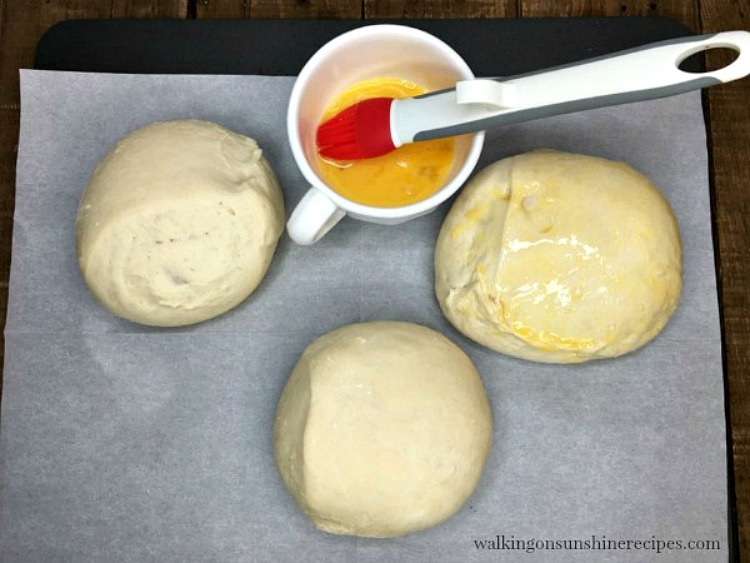 Brush the bread dough balls with the beaten egg. Bake in a preheated 350 degree oven for about 25 minutes or until the bread dough balls are golden brown. Cool on a wire rack for about 15 minutes. 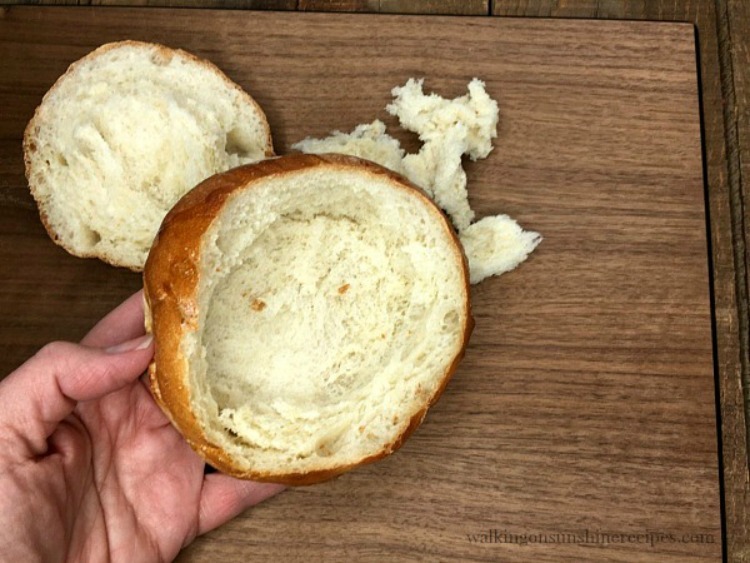 With a knife at a angle, slice the top off the bread bowl. Gently remove a good portion of the bread dough to make room for the soup. Fill with your favorite soup, stew, chili or even dip and serve. This recipe looks delicious. 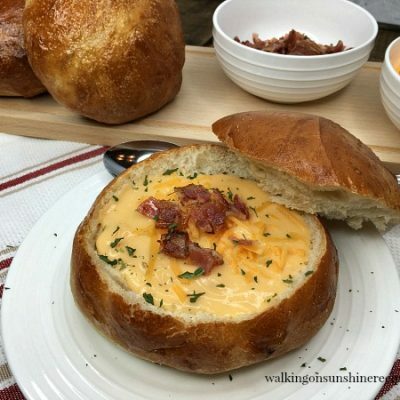 My husband likes bread bowls at restaurants, I need to try to make my own now! This sounds delish! I usually don't make my own bread for soup bowls! Our local deli sells bread rolls ready to be used for soup. This is a nice alternative backup in case they stop selling them! Ok, these soups look amazing!! I would totally love to enjoy some with maybe a salad. It looks amazing! We're all fans of bread bowls! I can't wait to make it! I love ordering bread bowls at restaurants but I've never made them at home. These look like something I could definitely make! This looks really comforting! Soup is always on our menu this winter! I'll definitely add this one! It looks amazing! I can’t wait to make it!